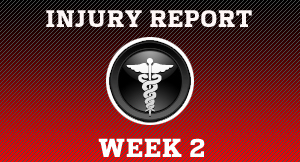 Week 2 is over and while some have players have recover a lot more have gotten injured. Two injuries that do stand out however are Jaye Howard of the Seattle Seahawks who will miss out more then half the season after suffering a compound stress fracture in the game versus the Denver Broncos. The other notable injury was to Oakland Raiders wide receiver Jacoby Ford. Ford was injured after getting hit in the game versus the New Orleans Saints and he is expected to be out for the next eight weeks with a herniated disk . Below is the complete list of injuries as we enter week 3 of the preseason.